How Much is College Worth? 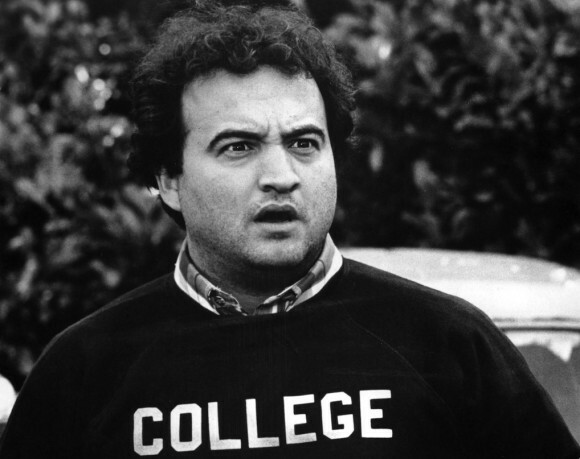 John “Bluto” Blutarsky in 7th year of college. Eventual U.S. senator. My Chicago Cubs just made a trade for center fielder Dexter Fowler, a 6-year Major Leaguer, who will make $9.5 million in the upcoming final year of his current contract. Coming out of high school in Alpharetta, Georgia, a suburb of Atlanta, he had the opportunity to get a full ride to Harvard University, but chose to take the money of a 14th round draft pick to try to get to the Major Leagues quickly. It was an interesting choice for an 18-year-old kid. Harvard versus Minor League baseball and a small cash bonus. It reminds me of Billy Beane, the Oakland A’s general manager who had to choose between an offer to play baseball at Stanford or take a $100,000 signing bonus as a first round draft pick of the New York Mets in 1980. At the urging of his parents he took the money and spent most of his baseball career as a player scuffling in the Minors. How much is a college education worth? How much is an education at Stanford or Harvard worth? You can figure the cost of tuition and room and board, but the true value in dollars of connections, urbanity, and love of learning cannot be measured in pecuniary terms. Dexter Fowler’s gamble on baseball over Harvard worked out for him. On the other side of the spectrum, so many millennials are choking on debt from four years at Podunk A&M or even Dartmouth or Duke. In a changing job market more kids and parents may reject the expensive gamble on college. Money might be better spent traveling the world. I think of all of the young Israelis who travel the world after compulsory military service. They end up much more worldly and educated than provincial Americans who may never leave Nebraska. I recently had a long phone conversation with Analisa Rudy, who along with her husband Eric Mott recently bought 60-year-old Cecor Corporation, which makes “Shark” sump pumping equipment and high quality shop carts. She piqued my interest by sending me an email with the subject line “take a dump.” I figured somebody with the sense of humor and audacity to approach me with that subject line was worth connecting with. She was charming and enthusiastic about the business challenge she and her husband have taken on. Sludge is exciting if it is your life’s work. We are not defined by what we make or sell. The most mundane products are fascinating to the people who use and produce them. To the uninitiated, a simple brass fitting selling for 50 cents at Home Depot is utterly boring, but the nuances of that fitting are almost endless. How is the brass made? How much copper, brass scrap and electric power went into manufacturing the rod? Where was the brass made? Where was the fitting manufactured? Did Home Depot buy it in China or Thailand or Ohio? Was the thread cut or rolled? These are questions that barely touch the surface of that “simple” 50 cent fitting at Home Depot. I am sure the challenge of making a high quality, competitively priced shop cart is equally complex. I laud Analisa and Eric for putting their money and energy at risk in the untidy world of rolling carts and gunk removal. Business is messy and so is life. Good luck. Question: Should the government pay for Americans to go to college? One of the reasons college tuition has increased exponentially over the past decade is government student loans have kept up with the college asking price. This is a classic example government interfence in the free market resulting in an expected outcome. If student loans were few and far between colleges would be forced for reduce tuition. If Obama starts to provide “free” junior college, junior college tuition will likewise become unafordable. We have alread seen the result of government take over of medicine, which has resulted in a marked escalation in health care premiums. The cost of Obamacare is now $50,000/enrollee per year. I was paying $10,000/year before the ACA was passed without any government subsidies. If Obama is interested in increasing employment he should be encouraging trade school education, not 2 years of useless junior college english and psychology courses. College, is worth what you pay for it. That will determine what it is worth to you. If you do not have to pay as you go and defer it for later in life Ie student loans back by the federal govt. then it WILL NOT BE valued. I have a successful business ( in and on my own terms) with only some community college night school classes, about 10 in all. All related directly to what I do. Some classes I paid for some my previous employers paid for. Best money spent all well under $5000.00 including books. Robert is spot on in his assessment of govt handling of what should be private business. If any one can screw it up our govt is the supreme champion of it. It won’t be free, they will have to work for it. A whole 8 hours per semester. That’s Obama’s definition of work. You grossly underestimate a large percentage of students that hold at the very least 1 job and attend school full time. No not at all. I know many of them bust their a$$ and make good grades at the same time. I’m talking about Obama’s free college. But he said they will have to work for it, 8 hours. I’ve read they will receive somewhere around $3800.00, that’s $475.00 an hour. However, seeing as how pay gaps have exponentially spread over the years the requirement necessary to close the gap and create a strong middle class relies heavily on a better education for the average person. The average person cannot afford 10k+ a semester per student, so loans are a great way to offset this cost temporarily. The hard reality young adults face today is coming out of college with 40k+ worth of debt and becoming susceptible to living at home instead of being able to acquire financing for their own home. Loans for automobiles are also harder to obtain. This hurts 2 primary industries in our country. This debt creates a burden not only on the current generation, but past generations as well since we now have children living at home with parents far much longer than previously anticipated. Lower cost transportation? What do you have in mind. Lower cost on higher education? How. Military cuts? Haven’t they already cut hundreds of billions. How much more should they cut? Should the government pay for Americans to go to college? Good God, no. Look at the mess that’s K-12 education and look at the mess higher education’s becoming due to the influx of government money. The reason America’s higher education system’s the envy of the world is specifically because it wasn’t built on government money and it’s suffered as a result of the influx of government money. Not that you can get many people in higher education to admit there’s a downside to to all that money but there very obviously is and it’ll only get worse. As to how much college is worth, we’re closing in on an answer to that question and it’s beginning to look like the answer’s “not as much as we thought”. Not that education doesn’t have value; it obviously does. But even things of great value generally come with a price tag and college is no exception. Some colleges, notably liberal arts and law, are already feeling that pinch. They won’t be the last and perhaps, if we’re very lucky as a nation the conclusion we’ll draw from the on-rushing disaster is that you can fight the free market but you can’t win. At the request of HIS OWN PARTY, Obama finally dropped the prospect of putting the bill for free Junior College solidly on the shoulders of the middle class. That would’ve been political suicide. My wife and I put ourselves through college (and my wife through NYU law school). It’s wasn’t easy, but we managed. College isn’t for everyone. I’d rather see a resurgence of trade schools that are affordable and devoid of any government interference. As far as sports figures taking high risks in lieu of education, I think it’s foolish. Only the best of the best make it to the big time, and one major injury can put out fire pretty fast. When you have that kind of opportunity put in front of you, of course you take it, but for goodness sake, do an online degree while your traveling about! Give yourself a backup plan, because you never know what tomorrow may bring, good, bad, or ugly! Remember the only source of income the federal government has is TAXES. The government has nothing except what it takes from us. Whatever the government runs, it ruins. 7 years of collage down the drain.